Studying the position of the planet Mercury in your birth chart can be the best way to learn about your personal reasoning and communication. In Western Astrology the location of Mercury when someone is born is an indication of that person's probable intellect, aptitude and communicative skills. Mercury and its astrological influence takes a full year to pass through the twelve zodiac signs and concentrates on thoughts and language in everyday life. The astrological significance and the positioning of this celestial body helps piece together a more complete personality profile. It assists in revealing an individual's strengths and weaknesses in these important areas of their character. It also provides some clarification of the reason behind a person's ability or inability to assert themselves. Mercury is the smallest planet in the Solar System and the one that is closest to the Sun. It can be seen from Earth but not with the naked eye and only usually in twilight. 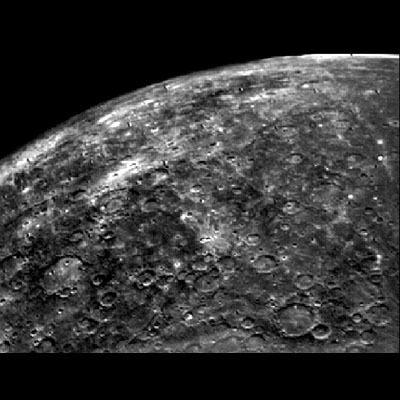 Little is known about Mercury other than it is similar in its crater surface to the Moon. It consists of an iron core and a magnetic field that is around 99% weaker than Earth's. This dense planet has no real viable atmosphere and remains mostly unexplored and mysterious. If Mercury is prevelant in your horoscope interpretation it is often an implication that you will be effectively expressive with your communication. The other celestial influences surrounding the Mercury point will help you assemble a clearer image of how, when and why an individual communicates best. Myths about Mercury are very few and information is mostly from the ancient Greek and Roman observations. The Greek's idolized the God Hermes and referred to him as the messenger to all the other Gods for his speed and excellent articulation. It was also believed that Hermes delivered dreams to humans as a gift from the King of the Gods Zeus. Travelling between different places in the planetary system he quickly became known as the deliverer of messages. The Romans later adopted the myth of Hermes and renamed him Mercury and this is where the reference to this fast moving planet is thought to originate. Mythology surrounding the Roman God Mercury is full of citations of his great talent for expressing and conveying ideas and thoughts at speed. Remembering this particular legendary figure's abilities can be useful to recall the astrological meaning and significance of Mercury. It will help you when analyzing a horoscope chart to easily identify the symbol for the planet as it resembles the description of the God Mercury. He was described as wearing a winged hat that helped him fly and this shape forms the top of the Mercury symbol. It is then also easy to remind oneself of the connection between Mercury and its influence on written and spoken communication and comprehension. The point where Mercury lies in a birth chart can place emphasis on a person's intellectual potential. It can disclose the destined possibilities within their personality in terms of their ideology and verbal and academic expression. This fascinating aspect to a person's character is valuable in determining their likely suitability for following certain professions and personal relationship pathways. Mercury positions in a reading are also a good indicator of someone's entrepreneurial ability. This business orientation skill is another of the Gods Hermes and Mercury's well known talents that is highlighted inside a plotted horoscope. The symbol used to identify Mercury in Astrology consists of three parts, a crescent, a circle and a cross. The resulting icon has the appearance of Mercury's winged headgear and his staff. His caduceus was believed to also have wings and the protection of two snakes wound around it to guard it. The crescent represents the mind, the circle stands for divine spirit and the cross for astral matter. The complete symbol for Mercury is often utilized as a sign for commerce as well as contact and correspondence. It symbolizes the exchange of concepts, the power of negotiation and the deliverance of news, thoughts and feelings. Conveying your needs and opinions is the main area that Mercury is focused on for Astrology purposes. It is worth exploring this in horoscopes as it can give out interesting insights. Mercury in an astrological sense is ruled jointly by the two Western Sun signs Gemini and Virgo. This pair of signs are among the most talkative of all personalities. In a natal chart the placement of Mercury can uncover peoples methods of articulating themselves. When this is viewed alongside the other plotted influences in a horoscope outline it will make more sense. Examined next to the basic Sun and Moon locations in a natal plot it can help explain in more detail the egotistical and emotional aspects of personalities. If the Mercury birth arrangement is well placed it can pinpoint and accentuate overly extrovert communicators like entertainers, public speakers or diplomats. 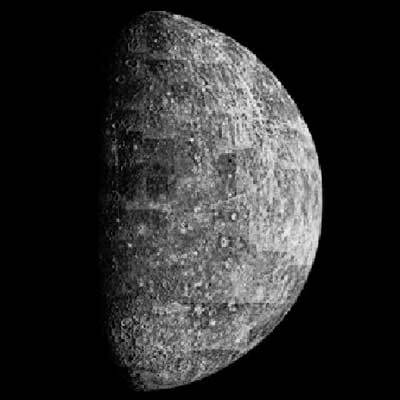 The photomosaic of the planet Mercury was assembled from individual high-resolution images taken by Mariner 10 shortly before closest approach in 1974. Crater Kuiper, named after astronomer Gerard P. Kuiper, can be seen just below the center of the planet's illuminated side. The landscape is dominated by large craters and basins with extensive plains between craters. The small, bright halo crater is 10 km (6 mi) in diameter. The prominent crater, which has a central peak, is 30 km (19 mi) across. The darker, lightly cratered area may be an ancient lava flow. 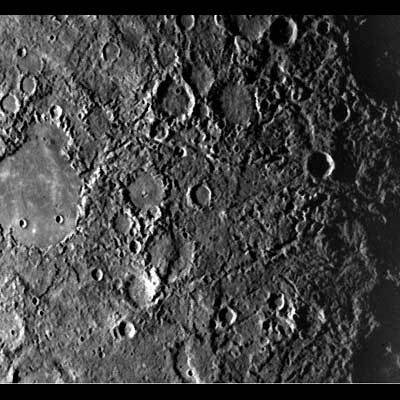 Mercury's surface is similar to that of Earth's moon, where a history of heavy cratering is followed by volcanic filling. 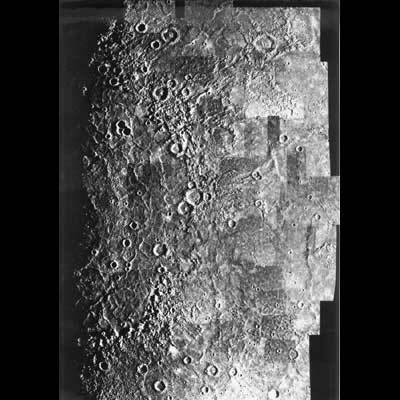 Weird terrain best describes this hilly, lineated region of Mercury. Scientists note that this area is at the antipodal point to the large Caloris basin. The area covered is about 800 km (497 mi) on a side. The best southwest quadrant of Mercury is taken March 29, 1974, by the Mariner 10 spacecraft. The picture was taken four hours before the time of closest approach when Mariner was 198,000 km (122,760 mi) from the planet. The largest craters seen in this picture are about 100 km (62 mi) in diameter. This Caloris Basin, which is thought to be similar to the large circular basins found on the moon. 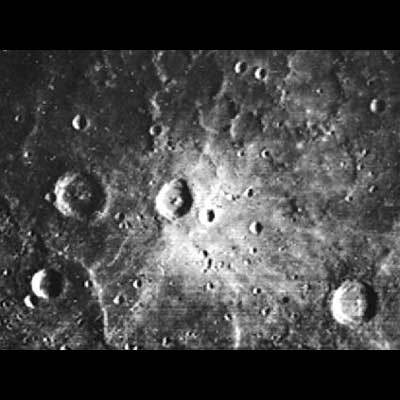 Probably formed by a giant impact early in Mercury's history, this basin was subsequently filled by lava flows. The nature of the wrinkle ridges on its floor is arguable: some scientists claim tectonics while others suggest they are due to volcanic flows escaping from fractures. ercury in Roman mythology , the god Hermes was called Mercury. "Hermes was the son of Zeus and Maia. (According to Hesiod) He presided over commerce, wrestling, and other gymnastic exercises, even over thieving, and everything, in short, which required skill and dexterity. He was the messenger of Zeus, and wore a winged cap and winged shoes. He bore in his hand a rod entwined with two serpents, called the caduceus. Hermes is said to have invented the lyre. He found, one day, a tortoise, of which he took the shell, made holes in the opposite edges of it, and drew cords of linen through them, and the instrument was complete. The cords were nine, in honor of the nine Muses. Hermes gave the lyre to Apollo, and received from him in exchange the caduceus." Goto Horoscope. Daily, weekly and monthly horoscope for each zodiacal sign. Astrological predictions showing the positions of the planets at a particular time and place. Meaning of the planets of the Solar System for personal horoscope interpretation. Hobbies, studies, avocational interests -- anything of a creative and original nature are favored during the afternoon. Avoid dealing in matters that are oppressive, confidential, or antagonistic to the interests of your loved ones. Your work responsibilities may diminish now, and a careless attitude could win the disapproval of others. Courage and strength win the day. However, by noon your hopes are up for the day. It's another day for using your imagination and doing the job more creatively. It doesn't matter whether you're making a large or small purchase, quality should be given precedence over price. Be of goodwill in love matters. You may be surprised to find that you have overlooked something important. Entertain a visiting guest or tourist in your home today. There are many good features to this relationship; you just need to eliminate the problems or be willing to compromise a little. Add to your wardrobe today. The herb that can't be got is the one that heals.